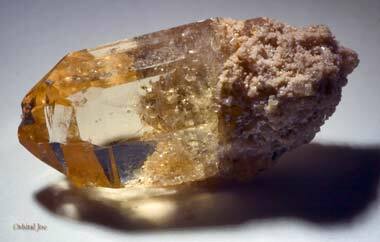 Sherry-colored topaz extracted by Utah Dave Merrill from the Wild Horse Springs area, Thomas Range, Juab County, Utah; photo by Orbital Joe on Flickr (noncommercial use permitted with attribution / no derivative works). 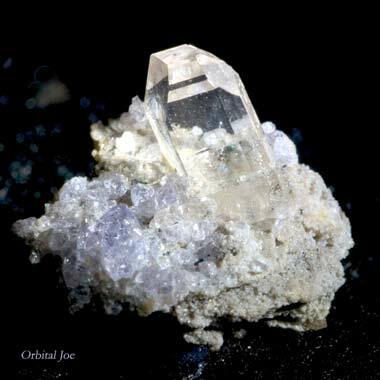 Small perfect crystals of topaz can be found on Thomas Mountain in Juab County, and semiprecious topaz gems are found in Beaver, Juab and Tooele counties of Utah. Topaz crystal surrounded by amethyst micro crystals on a Rhyolite matrix. extracted by Utah Dave Merrill from the Wild Horse Springs area, Thomas Range, Juab County, Utah - photo © Orbital Joe on Flickr -noncommercial use permitted with attribution / no derivative works.